I haven't been updating as frequently as I'd like. As a way of apologizing, here are some of the things that I've been doing that have kept me from posting. 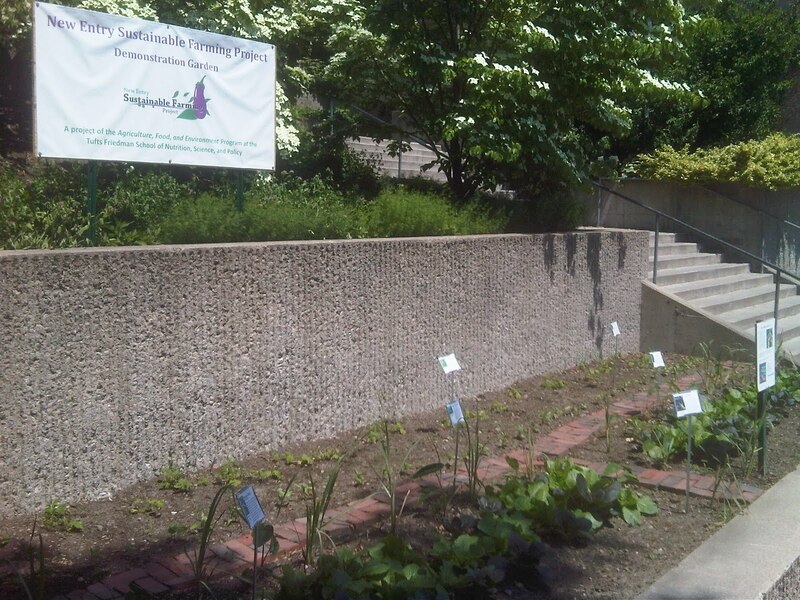 Vegetable garden in front of the Tufts library. I participated in a work-day with Tufts New Entry Sustainable Farming Project to install vegetables on campus in a space usually occupied by ornamentals. Check out a twitpic from earlier this month (courtesy of @TuftsUniversity) to the right. This coincides with a library display that I was peripherally involved with as well. Check it out if you're in the area. New Entry does some great work training young and immigrant farmers to have a profitable farm business in New England. Go peruse their website, and sign up for their CSA next year. It's great. I am now the manager of the Medford Farmers Market. I'm working part-time this summer and its been a great experience to learn the nuts and bolts of setting up a temporary marketplace. I've met a lot of great, dedicated people and am excited to see where the season takes us. Tufts Research Day on Sustainability. My friend Jeff Hake and I put together a poster on our work for a new proposal, the Tufts Community Agriculture Project. Check out a smaller version of our poster to the right (click for a bigger view). Tufts owns a 3 acre parcel of land in the city of Medford. We want to see part of that land turned in to an organic farm. There are lots of hurdles to jump between now and breaking ground and we will be continuing our work over the summer and hope to recruit a few current Tufts students to continue the cause in the upcoming year. I've changed around my blog design. And although I'm still not happy with it I think its a step in the right direction. Less flowery, more plannerly. A bit too militaristic for now, but with a few tweaks it could be right. And lastly, I've got a few publications in the works. If all goes according to plan I'll have something in print in both a journal and a book this fall. Hopefully one/both works out. Fingers crossed. I've had to turn down a number of exciting opportunities to finish up my thesis and finally get my masters degrees (which still isn't done). Hopefully soon I'll be able to get back on a regular schedule of sorts and try to finish all those projects I've started.